As has been the custom with these Monkish beers, there is no brewery description for this Double IPA, but all I know is that it is brewed with Galaxy, Nelson, and Simcoe. Pours like a dark yellow milkshake. Completely hazy, murky body and a finger of white head. Dank pineapple juice on the aroma. It's really just a hop juice explosion out of the glass with a good amount of pine hidden behind everything else. Some IPAs are hop bombs. Some IPAs are juice bombs. Every once and a while, you get one that combines both and Relax Your Mind has hit the ball out of the proverbial park (Gotta get those World Series references in while I still can). It was pineapple on the aroma and that is the first flavor that jumps out on the first sip. Then it's a rush of oranges, peaches, creamy sherbet. Not to be outdone, then the deliciously bitter hop juices kick in along with the dank Galaxy, and tons of pine and spruce. Grapefruit acidity, white grapes, and just an overall assault of tropical goodness keep the party going. That creamy sherbet comes back for an encore near the end, but now it carries with it this pop of bitterness that lingers for a while on each sip. This is truly the best of both worlds. Mouthfeel is creamy with perfect carbonation. It drinks as big as it should for 8.5%, but it never weighs you down and has no trace of alcohol. The amount of tropical juice goodness makes this highly drinkable. Out of all of my Monkish beers I recently received, this one is far and away the best. It's a dangerously drinkable hop & juice overload for the tastebuds which might be the best IPA I've ever had out of the West Coast. Hell, Monkish is doing New England IPAs better than some New England breweries, so those East Coast brewers may want to watch their back. 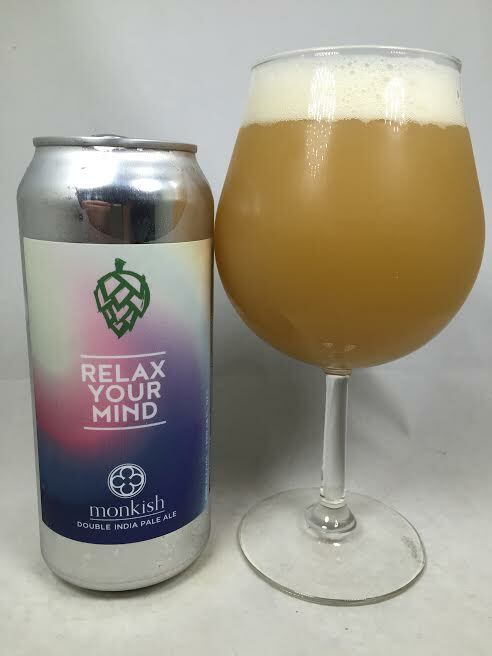 But yeah, Relax Your Mind delivered as a world class DIPA and Monkish is just killing it out in California.